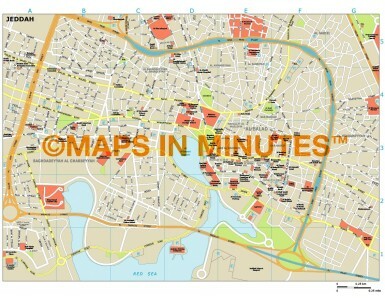 Small scale, up-to-date, detailed, 100% editable layered vector map. Suitable for use from A4 to A3. Jeddah city map giving good detail and area coverage including important buildings & places of interest. These City and Town plans have been developed to be equally at home in print and screen environments and are licenced for use both in print and on websites. Being vector format they are 100% editable so they can be easily customised. Available in Illustrator CS (PDF format coming soon). Layers include: Coastlines, county boundaries, Settlements layered by population. Physical features include rivers and river names, lakes and lake names, island, bay and headland names. Formats: Available in Illustrator CS1 (for use with Illustrator CS1 to CS6 or later). Licence: Please click on the Licence tab to download and print the lifelong licence for this product. How to download: You will be able to download by logging into Your Account where you can check the status and details of orders (including the applicable Product End User Licence). You can download product purchases for a period of 10 days from date of purchase. Authors notes: If you would like a custom map created to your requirements please Contact Us for a quote or give us a call to discuss.